The Occupational Safety and Health Act of 1970 clearly states our common goal of safety and healthful working conditions. The safety and health of our employees continues to be the first consideration in the operation of this business. In our business, safety and health must be a part of every operation. Without question, it is the responsibility of every employee, regardless of his or her position in the company. It is the intent of Smith Erectors to comply with all laws. In order to comply, we must constantly be aware, in all work areas, of conditions that produce injuries. No employee is required to work at a job he or she knows is not safe or healthful. Employee cooperation in detecting hazards, and in turn, controlling them, is a condition of employment at Smith Erectors. Supervisors are informed immediately of any situation beyond an employee’s ability or authority to correct. The personal safety and health of each employee is of primary importance. The prevention of occupationally induced injuries and illnesses is of such significance that it will be given precedence over operating productivity whenever necessary. In keeping with the highest standards and to the greatest degree possible, Smith Erectors Inc will provide all mechanical and physical facilities required for personal safety and health. Smith Erectors Inc will maintain a safety and health program conforming to the best practices of organizations of this type. To be successful, such a program must embody the proper attitudes toward injury and illness prevention on the part of the supervisors and employees. It also requires cooperation in all safety and health matters, not only between supervisor and employee, but also between each employee and his or her co-workers. Only through this type of cooperative effort, can a safety program in the best interest of all be established and preserved. Our objective is a safety and health program that will reduce the number of injuries and illnesses to an absolute minimum. We will be not only in keeping with, but also surpassing the best experience of operations similar to ours. Our goal is zero accidents and injuries. 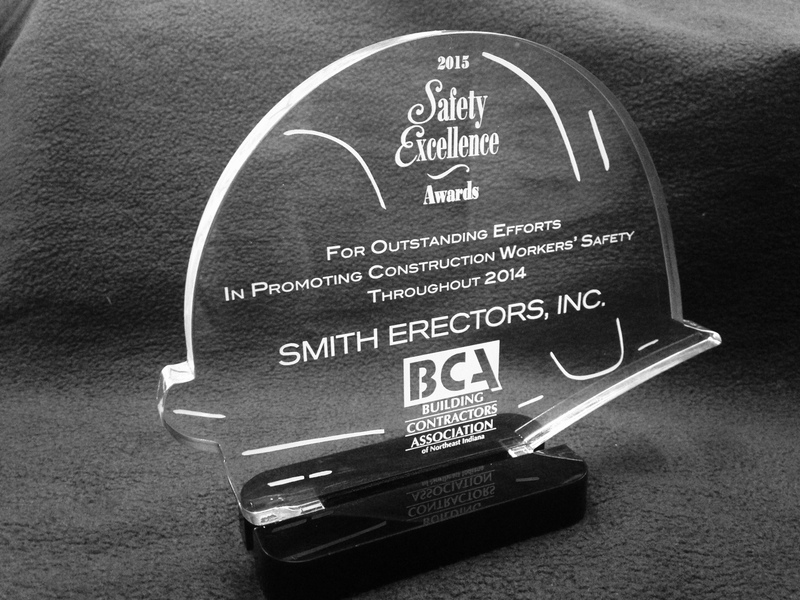 The BCA Awarded our company with the Safety Excellence Award for 2014. Smith Erectors Inc. strives to make evey project safe while maintaining efficiency. We equip our foreman with knowledge and enhance their thinking with state of the art training. We maintain our safety program with Daily Pre-Task Assesments, audits and Job Hazard Analysists. Most importantly, we create an atmosphere that feels safe and we embrace every worker to contribute to their safety and the co-workers around them. Thank you BCA for recognizing our efforts. The Safety Director accepts the responsibility for leadership of the safety and health program, for its effectiveness and improvement, and for providing the safeguards required to ensure safe conditions. Foreman and other members of management are responsible for developing the proper attitudes toward safety and health in themselves and in those they supervise and for ensuring that all operations are performed with the utmost regard for the safety and health of all personnel involved, including themselves. Employees are responsible for wholehearted, genuine cooperation with all aspects of the safety and health program – including compliance with all rules and regulations, and for continuously practicing safety while performing their duties.